The ThINKin' Spot: Sneaky Peeky Time! Good morning! Welcome to The ThINKin' Spot and happy Thursday to you! There's lots to be done today, but I just couldn't step outside without sharing a sneak peek of what's soon to come to The Peachy Keen Stamps Store. These new stamps are just gonna blow you away, and I can't wait for you to see them all. Here's a little sampling of what I've been up to with them. 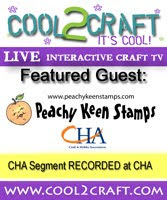 We're having a release party on The Peachy Keen Connection Sunday at 6 p.m. (CST), and I sure hope you can be there, because there'll be prizes, chatting with the design team, games, challenges, and as always LOTS of fun! Looking forward to seeing you then!!! Have a blessed and beautiful day!! This is so adorable Lorie!!! Looking forward to seeing the new release!! What a perfect little teacher! You coloring in the hair is Fabulous! Lorie this is so gosh darn cute! Lorie this is a masterpiece! Every detail is absolutely perfect! Love your card and this release is probably my favorite!